A.I. defeats one the world's best Starcraft 2 players: What does this mean for businesses? 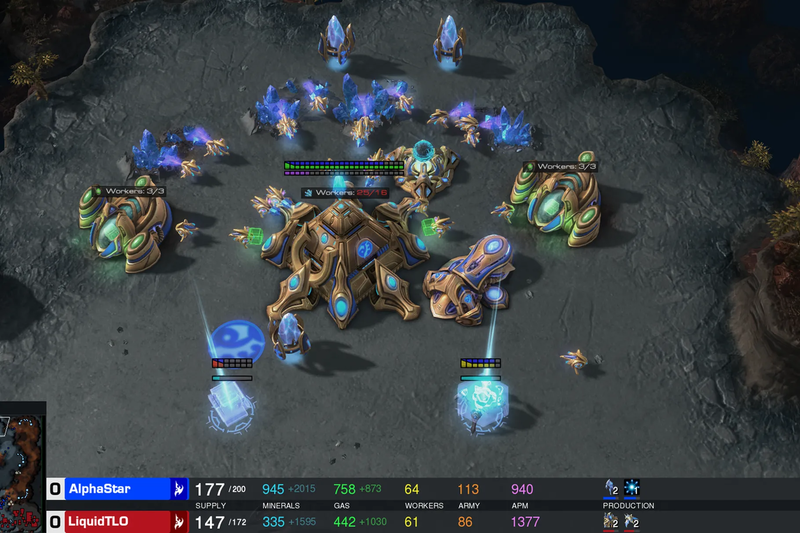 Google’s latest AI research project: AlphaStar, beat ‘MaNa’: one of the worlds best players at one of the worlds most complex wartime strategy games: StarCraft II. This breakthrough is greater than their last monumental achievement, beating the worlds best Chinese board game player at Go. To put the sheer scale and complexity into perspective, Go, has 10^170 potential decisions and plays you can make. (This number is larger than there are atoms in the universe!). The complexity level of StarCraft II? 10^1685. A number so mind-bogglingly large, I can’t find a metaphor for it. Google Deepminds’ Alphastar won: 10 wins to 1 loss. 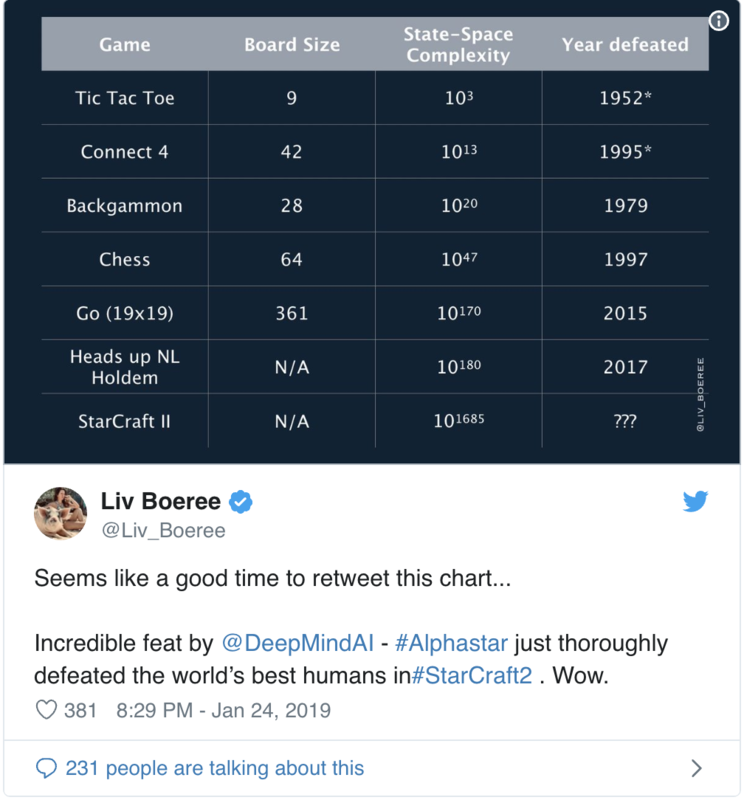 If you’re looking for a summary of what happened and how AlphaStar won I’d recommend Vox’s article here or Deepmind’s personal blog, which goes into fascinating detail about how it trained AlphaStar here. Our job here at Filament is to help you the understand the consequences of this groundbreaking event, what it means for businesses and how you might apply this technology. So, how can this research be applied? StarCraft is an incredibly complex game, which made it fascinating to see the pro players talk about their experiences vs AlphaStar after the first 5 defeats. It shook their world and tested many of their beliefs. For example, at the start of many of the games, AlphaStar was using a strategy every pro commentator and pro player considered extremely inefficient. In the first match, they were even bold enough to subtly mock AlphaStar at this ‘non-pro’ play. Yet, AlphaStar still won. You could visibly see some of the commentators go through the 5 stages of grief – especially denial, which was sadistically hilarious to watch. Search and understand why AlphaStar was executing this strategy. Decide if it really is better than their current system. How they can counter it in the future. This is just one simple example of 100’s of moments where these pro players with 20+ years of experience in this one game, were forced to review their whole strategy and skills as AlphaStar decimated ‘MaNa’. Even a couple of days after the event, pro players have already adopted some of AlphaStars’ techniques and have become better players because of it. Artificial Intelligence is a technology that can open new doors; a new way of finding out those unknown-unknown areas and processes of your business. What figure of value would you put to receive the same shake up and gather the same level of insight for your organisation? The techniques behind AlphaStar are useful in solving other problems too. It’s neural network architecture is capable of modelling very long sequences of likely actions – with games lasting up to an hour with tens of thousands of possibilities – all with imperfect information. Retail allocation prediction – what’s considered the holy grail for many retail – where we can finally identify where online browsers become offline buyers. Only 9% of purchases are online, but 75% of shoppers do their research and browsing online first. ‘Flexible’ chatbots – Technically called “next best action”, chatbots have come a long way in recent years with modern NLP models such as BERT. Where this deep learning technology could really help is enabling chatbots to know what to do with utterances given to them. Today, most chatbots are rules driven and limited design flows. If you treat a chat conversation between a bot and human a bit like a 1v1 game, the exciting possibility is to train your chatbot to what actions to take or where to drive your user towards particular actions in a more autonomous way. For example: The chatbot could respond to a disgruntled customer in ways that de-escalates their situation (instead of just auto responding with: “sorry I didn’t understand, can you repeat or I can forward you to a human) which will reduce consequently churn and improve net promoter score (NPS). On the other side of the coin, the chatbot could learn how to persuade happy customers to buy more/upgrade their subscription. Energy usage optimisation – The Deepmind team are already applying this type of deep-reinforcement learning on their own data centres and improving energy efficiency on their android devices. Evidently, it still has some work to go, but it’s becoming tantalisingly close to transforming from research, into applied AI. This being said. It is well worth noting, most business are not ready to consider using this technology. The next challenge for the majority of businesses is making sure our data is ready to take advantage of this bleeding edge technology in the coming years. The best place to start to ensure a smooth transition is by trying out some early data studies and try out a very narrow AI program which is relatively low cost and low risk to execute.